A Form Of Flattery Or A Coincidence? I love to multi-task…especially with my knitting. Yes, I have more than one project going at the same time, and I don’t feel the pressure to complete a project before I begin another. Knitting for me is about the process, working with color, and the tactile relationship between my needles and yarn. Currently, a pattern published in Palette by Classic Elite Yarns called “Chromatic” captures my attention. The body of the piece knit sideways with identical front and back pieces are constructed by picking up from the edge of the body. The pattern calls for “Liberty Wool Print” made in Italy. Working with this pattern reminds me of all the “historic” Classic Elite Patterns in my collection. I refer to these patterns as “historic” because they are tangible…printed on a piece of paper, reminiscent of fashion, and reflect the knitting popularity of the late 1980s and 90s. Actually, Classic Elite Yarns has been around since the 1940s (www.classiceliteyarns.com). Norah Gaughan, Deborah Newton and Kristin Nicholas designed for Classic Elite Yarns and are still actively involved in knitwear design. I’m awestruck by the far-reaching talents of the blogosphere, a global community at our fingertips. Though, I still believe it’s a “small world,” a sixth degree of separation sort of thing. “Did I mention Kristin Nicholas?” “Yes, I did.” Check out http://www.ravelry.com/patterns/library/tommie found in Book Three, published in February 2013 (pictured on the right). 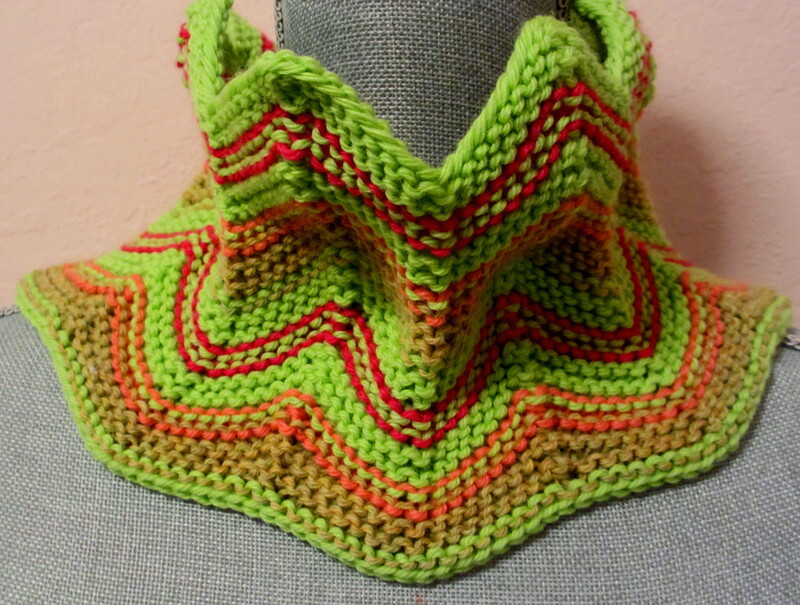 Refer to my blog post Chevron Cowl of December 5, 2012 (pictured on the left). Is this a form of flattery or a coincidence? I’ll let you be the judge. Previous Previous post: Got Gauge?